Valentino took drama to its height at its spring couture collection in Paris, where Celine Dion wept theatrically as a solemn Naomi Campbell swept past to close the house’s show in a see-through black organza gown. The VIP crowd that was surrounded last Wednesday by multicolored perfumed flowers whooped during a standing ovation as snow fell outside. 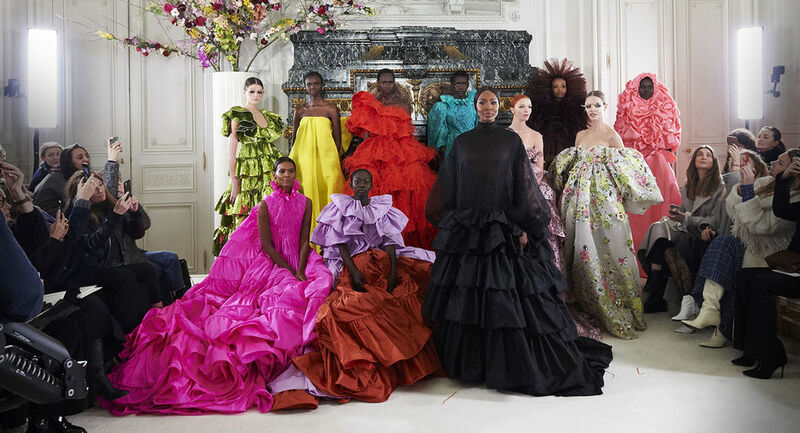 On couturier Pierpaolo Piccioli’s request, Valentino’s seamstresses named each and every couture dress after a flower or emotion. This detail reveals the preciousness that the designer and his atelier bestowed on the 65 carefully constructed looks, in which each model was transformed into a silken bloom. A surreal red rose hood opened the collection, enveloping the model’s head. Later gowns were less unusual or daring, producing a display in which Piccioli offered a more classical interpretation of floral couture. The effort lacked some of the vigor of Piccioli’s standout collection last season, but it was poetic, thoughtful and color-rich. Aquarelle floral print on a draped pant look sported billowing sleeves that harkened to the Italy-based house’s touchstone of the Renaissance.